"To apply design to the issue of weight savings in light weight backpacking through optimal integration of backpack and tent. This is a structure/system for playing in nature. Enables one to enjoy the outdoors in optimal comfort, freedom, and ease by making it more accessible. By evaluating the needs of the casual hiker, and dedicated thru hiker alike, I hope to draw out the criteria to develop a system for carrying and sheltering. This system will balance weight savings with comfort, durability, safety and convenience features. My goal is to give the user the peace of mind over gear so that the experience of enjoying the wild is optimized and encouraged. " I am reaching out for insights, suggestions, materials, technologies, stories, or anything you may think of. I feel there is room for designing the tent and the pack around each other to get more out of each part of the system. My belief is that if the tent and pack can work together better, it saves weight, adds connivance, and promotes more connection with the wild, not the gear. I like the idea. 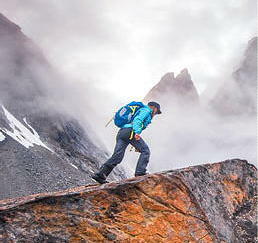 I often see backpackers as space men/women in our gortex bubbles cut of from the experience. Im sorry, the story on Grandma Gatewood is very isprirational, ill be sure to listen on on that, but I saw no mention of a shelter. I like your analogy with the gor-tex bubble. I want to see if we cant balance the best in technology, with the types of experiences that are most holistic (think Thoreau and Robert Frost). I am intrigued by tarps/tarp tents or some sort of transparency to the surroundings. Is cuben fiber a bit transparent? I remember in the past coming across someone else who was doing this that seemed more integrated than those guys. Look up the gearskin and the jakpak. FYI, I prefer a separate shelter. I like being able to take the shelter required for the environment - would not want it attached to the pack as it would be impossible to base camp. I agree--different trip scenarios, different shelters! Cuban is more translucent than transparent. I've made shelters out of clear plastic tarps. My experience with them is that they work pretty good. This past season I made a "Thoreau" style tent out of plastic "SOL emergency blankets". This style is often called a "Baker's Tent" or "Campfire Tent" because it's optimized to capture heat from a campfire that's built in front of it. As you can see in the photos, mine has a clear plastic front. This tent is very light, and when you have a campfire going it's very warm inside, even in below freezing temps. If there is an efficient way to dual purpose an item then we're all interested in that as a design concept, but even component based designs limit our choices to those designed for the system, and the ability to mix and match is highly desirable, which means integrated pack/shelter systems are not very desirable. The best way to make a shelter integrate with a pack it to make it light and small. The only other way is to build the pack around the shelter, and that limits our choices of packs. Not to mention - do you have to stand in the rain emptying out all your stuff before you can set up the shelter? Good luck, but I'm rather skeptical of your project. My own take is that something designed to do two jobs doesn't do either one of them well. I gave up on my multi-tool because the knife blade was too short and didn't lock, the scissors didn't cut very well, the tweezers weren't pointed enough to be effective,and I never used the other gadgets. I now happily carry a locking knife, folding scissors, and good pointed tweezers. You can probably design such a combo, but I'd bet it won't carry comfortably because the suspension won't be sturdy (it would have to be pliable for the tent application) and (with all the seams for the pack and the fact that it would almost surely have to be single-wall tent) it will either leak or suffer from terminal condensation - and the Pack-A-Tent will end up weighing more more than a separate tent and pack put together. Like I said, I'm skeptical, but I still hope you pull it off. The only constructive thought I have is that you might be able to overcome the suspension issue by incorporating the sleeping pad into the pack as a "framesheet." That may well limit the load-bearing capability, though. Be sure to let us know how it turns out - preferably with pictures. As the idea of what you're trying to do has wandered in and out of my mind today (no map or compass, so it got lost a couple of times), I was thinking about the huge difference in the amount of material needed for a pack versus even a one-person tent - where will all that extra tent material stow when you fold it into a pack-size container? As I thought more about it, perhaps one refinement of your criteria has to do with the type of shelter. Maybe, instead of trying to develop a "Pack A Tent," you could figure out how a pack could transform into a bivy sack. The two would seem to share more features, and the bivy sack might come closer to using the same amount of material as a pack. For a couple of ideas, look at the REI Minimalist and the Integral Designs Salathe - if you could combine the weight of the Minimalist with the really great ventilation of the zip-down top of the Salathe, you might be onto something. The roadblock is the fact that, in a bivy, there's nowhere to stand or kneel to change clothes or pack/unpack - most people also take a tarp. But, even with a small tarp, you could save some weight if your pack turned into a bivy sack. Thank you for your insight, these types of shelters are really cool, thought I feel that they are a bit big for backpacking. The use of a fire for warmth is awesome, but very specific to types of hikes... especially when/where you can build a fire. Then again, getting up to keep it going. My family, since I was 6, are historical re-enactors of the 'French and Indian War' (pre revolution) and The Revolutionary War. This has included many canvass based tenting experiences in all weather. With my father and some others I have done period scouts in Maine in mid January with temps at 0F and below, we did two lean-to shelters of canvass apposing each other with a narrow 6' long fire in the gap. With lots of wool, shifting in the night, stoking the fire, it was ok. The more insulated/modern version seems ideal, but still limited to fire use. I like the analogy of the swiss army knife effect...all in one=poor individual items. I use the term "integration" as an ambiguous term to say that the elements will not be one, but only complement each other as much as possible, before the pocket-knife effect begins. I do agree that I will rely on some version of a single wall tent, but maybe it could have some minimal inner, or enough ventilation to compensate. Condensation is indeed a major factor, thank you. The sleeping pad integration is also a quality idea, i will be sure to explore this. I will be sure to document my process when I start my true ideation and testing in the next few weeks. My summer semester will start May 9th, and right before this I plan to get out for a week at minimum to try out options and just get my head in the game. Thanks again for your help! To all: Thank you for your help, i truly appreciate your time and comments. I have made some more clear decisions in light of many of your comments and other research. I want to focus as much as possible in immersing the hiker in nature and facilitate that experience and interaction. I want to keep some luxury items (in comparison to UL) available in terms of pack weight capability and shelter above the raw tarp. I am trying to keep things specific though, as I have only so much time and resources. If i am not careful, I will end up just designing my own dream camp, which is more me, than useful to many (industrial design is a mass market approach). I see the UL tarp and bivy set up work well, and again, there is little frame at base weight sub 10lbs... The needs of UL are so specific, it ends up as custom gear for the ONE individual. To be fully rugged, we could all be like Grandma Gatewood and cary a shower curtain and a blanket with some sneakers... but I see room for luxuries. I am young, I am quite comfortable carrying over 15lbs, but I see lots of benefit in keeping it all sub 30lbs. There are a enough of us who I feel would say the same. Primarily I am looking to find a shelter and pack that complement each other and "integrate" as much as possible, while maintaining the full benefits of individual systems. The structural elements seem the most likely subject for dual use in the packs and shelters, while the shelter its more likely to be on its own. I most like the idea of a fully modular system that adapts to the trip the user seeks, within boundaries. My obstacle is the user group... I see the all out ultra lighter/thru hiker demographic to be not as viable for this idea, as the extent of the minimalism negates benefits of my ideas (good points from many readers on this like trekking poles and delicate items). The hiker/camper/"I backpack sometimes" is also not in my interest for this, as I see the needs of that user not concerned as much on weight and unwilling to cope with the minimal approach. I see room for a happy medium that I consider my ideal goal for myself, and I could see many adopting. One that is of a minimal approach with room for simple luxuries while longevity, durability is not lost so as to keep the gear adaptable to a variety of applications (solo weekend light, couples, week long--short thru hike, and such). Not a full UL approach, but a step above in the 30lb. max total weight. I think the modular/adaptive idea is very inviting, which will give the user say a simple kit, framed within tight guidelines, that let the user fine tune his/her self. This is the process of any avid backpacker, but the adjustments should allow scaling from solo short hikes, up to 2person week long unassisted (beyond a week, most thru hikes are assisted at least weekly). The brutality of the AT, PCT, and so on destroy gear, and long thru hikes are more of a lifetime goal for my user....thus the max test would look more like the Long Trail in VT or equivalent. My final question is, is it so bad to have a 25lb pack over a 10-15 total? Many a fit person can handle such a load over more terrain the one has the time to cover in the busy schedules we have preoccupied our selves with. With respect to the UL purists (and one day i may join that camp) i feel a need to find a balance. maybe its a UL crossover training module? One that is specific, yet adaptive and flexible so that one may use other types of shelter to add comfort, or less weight for the trip at hand. To give people not so much a transition to UL, but to hit at it, and let it be a stepping stone to UL and a fall back for comfort when UL isn't felt as necessary. Any help drawing some boundaries to this would be great, I know its still a broad topic. I will soon set up some sort of blog or site where I can post my progress, you all can follow along as you wish and maybe i can give back some advice as I learn myself. Thanks for all the support, it is quite encouraging. P.S. I have a simple survey asking your personal background/views just to get a feel for what people want in backpacking. I hope I am not overloading this forum, I just finally get to do a project i can be fully passionate about. Thanks and HAPPY TRAILS! I think you are defining UL as "people who are concerned about lightening the pack." The UL craze is an end unto itself - they are MOST concerned about being as light as possible, to the point that they are not so comfortable as they otherwise might be. I think most of us here fall into the category of lightweight - we value function and comfort more than being light as possible, and if a lighter item will work that's what we go with. But with a shelter or a pack, my ultimate priority is COMFORT - I refuse to compromise on the functionality and sometimes the primary function is my warmth or my comfort. A shelter NEEDS to be adequate to the task. If I know the forecast is for rain and there will be trees, I will take the hammock and tarp every time. If it's alpine I'll take a solo tent. Because if there is one thing that is NOT FUN about bivy sacks, it's being stuck in the rain, having to pee, and not wanting to get all the stuff wet when getting in and out of it. I will never be UL. My pack is 25 lbs for most things including Search and Rescue, but I won't be caught out without proper gear. Is a 25 pound pack "bad" and a 15 pound pack "good"? Not necessarily - but, personally, I'd prefer to carry the 15 pound pack because I'm older, and not in the greatest shape. However, that wasn't what took me under 20 pounds for a weekend. Rather, it was pursuit of simplicity, the desire for an uncluttered corner in my life, that did it. As I relentlessly simplified my style (replacing 2 pots, a bowl, and a cup with a single kettle that filled all those functions, for one example), the pack got lighter and I got happier on the trail. As far as carrying ability, they say 20 to 25% of your body weight is a reasonable comfort target (you can carry more, it just stops being comfortable.) I'd amend that to say 20% of your ideal weight, with any excess counted as part of your load. For example, if your ideal weight is 180, but you weigh 200, your reasonable load would be 36 pounds at 20%, 45 pounds at 25%. Deducting the 20 extra pounds you're carrying around gives you a target pack weight of 16 to 25 pounds - not the 40 to 50 pounds the gross weight calculation gives. A tent made with that material will retain body heat inside better than just about any material I've seen. It doesn't have to be a Baker's Tent to do that, I think one designed specifically to retain body heat would be worth pursuing. I did some testing on that concept and, again, I was surprised with the results. SOL makes a bivy with their material, it's not what I'd want in a shelter, but it's worth looking at. You don't *need* to keep a fire going all night long to stay warm in a "Baker's Tent" design, but a fire easily will warm that particular one up to 80�F inside, and when your inside one when it's 10�F outside, it's really, really, nice in there. The tent I made has a 42"x82" footprint and is 44" tall. It could be made smaller for a single person, but it only weighs about 1.5lbs and I like the extra room. A small tent that can take advantage of the campfire concept is worth considering. It adds something that's been lost for a long time. A square tarp can be configured into a Baker's tent. Turn the material inside out and it will provide shade *and* reflect heat. The material is ultralight and it's pretty durable. There are probably lots of better ways to design one for backpacking. Big Jon offers his Gearskin pack integrated into a shelter floor, then some tent or poncho options that can zip to the floor. It ends up bulkier and maybe not lighter than the Silnylon backpack and UL hammock that I carry, but you could learn a lot from Big Jon's ideas. It seems to me that the only pack-shelter integration that makes sense is using the shelter frame elements and sleeping pad to provide structure to the backpack. At first glance, it would seem that it might be worth exploring combining a pack integrating a half-bivy with a separate half-length, hooped tarp shelter for UL backpacking. You would get the best of both worlds : the convenience of a tarptent for unpacking, entering and exiting the shelter under precipitation, get (un)dressed, etc. and compact lightweight-ness of a bivy bag. In addition, on its own, the pack functions as an emergency bivy. The classic version of the mountaineering backpack Karrimor Alpiniste was just this combination of pack and half-bivy. In normal backpack use, the bivy top was folded down inside the pack. With the bivy part deployed, it covered you only to the armpits. Without a tarp, it worked as an emergency bivy and needed to be complemented by a mountaineering jacket (battened down as tight as possible). The removeable frame was made of two aluminum stays encased in a foam pad and could be used in combination with rope and slings as an emergency sleeping pad. However, all you save using this approach compared to one where the bivy is not integrated into the pack is the pack�s surface area in a lightweight fabric equivalent and a 2 sq ft bit of foam pad; ie, next to nothing; and that�s assuming that you are not squandering that weight saving with extra zippers, buckles, etc. In addition, you lose the flexibility of a separate bivy bag and have to worry about the integrity of your shelter getting compromised by rocks and branches poking at the pack. Karrimor still has the Alpiniste in its line-up but it no longer incorporates a half-bivy and hasn�t for many years. I guess that even in the UL world of mountaineering, you�re still better off having to choose between taking a full UL bivy and taking no shelter at all (other than regular mountain pack, boots and clothes) rather than having a half-bivy permanently attached to your pack. I think that for weight savings and peace of mind, not to mention pure simplicity, a light weight silnylon or cuben tarp thrown in to the bottom of any pack would suffice. I'm not trying to be a harsh critic, but a backpack/shelter combo just seems to be a little bit gimmicky and designed for a very select and narrow market. Mr. Scott, you are probably done with your project, so this is for discussion purposes, but I have always loved the idea of dual purpose equipment. Down jackets can be the top half of a shrunken sleeping bag...a poncho can be a sturdy shelter in camp, and an empty rucksack can be a sleeping pad for you legs. It's even been done for ages with capotes. Despite this, initially I baulked at the combination of those two categories of equipment. The disapparat needs they fill almost places them at odds, the exposure to the elements between pack disassembly and shelter construction among other problems seemed to advise against it. Then I remembered a Discovery Channel show about survival in alaska only with the basics. I remembered them using a plain blue tarp as a wrap for their ruck sacks and fixing shoulder straps somehow. It struck me as painful, but they were packing easily 40 lbs +. It did seem very rudimentary, but also very organic in design. Tweaking the idea, a person could start with silnylon or even cuben if experienced in taping and reinforce it with strap attach points. You could shape it like a six moons, etc, and wrap all of the gear up in it and affix the straps for backpack use. You could use light weight silnylon bags or a bag for keeping the gear water proofed once out of the pack. I think if you started with the shelter that you wanted and then worked back toward the needs of a pack, you could end up with the object of your desire. I am actually intrigued by this idea now. It could be reduced even further by taking a silnylon dry bag and making a set of nylon straps to make it a rucksack. This might defeat your purpose though.